Abstract: What makes the Coolink H1T standout from the crowd is first of all its copper base plate. 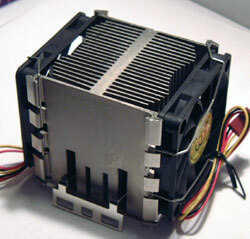 The Coolink H1T is the smaller brother to the Coolink H2T heatsink which features slightly larger 70mm fans. Equipped with two 60mm fans, the Coolink H1T is really meant for slightly less powerful processors, and quieter operation. With very few differences, we'll have to see just how much of a difference there is between these two almost identical models from Coolink. What makes the Coolink H1T standout from the crowd is first of all its copper base plate which is dip brazed to the base of the aluminum extrusion (which has been nickel plated for that purpose). The manufacturer also mentions that the aluminum has been copper plated (as part of the overall plating process), but I seriously doubt that the thin copper coating will add any measurable advantages to this heatsink in terms of thermal performance. Still, given the generally good performance of the Coolink H1T we have some pretty good high expectations for this 60mm variant, so hopefully it will be able to hold its own. Let's find out! Fan Specs: 4700RPM, 23CFM, 12V, 0.20A. The use of two fans on this heatsink - one on either side - could be useful in terms of cooling redundancy, and lower noise. Since the surface area is evenly split between the two fans, less noisy units can be used - theoretically. In reality, the fans are pretty quiet, but since they are in direct contact with the heatsink little vibrations can slowly seep through. List all Coolink heat sinks that Frostytech tested?